Welcome to IGNOU MS-41 Solved Assignment 2015 download section of myignou.in. 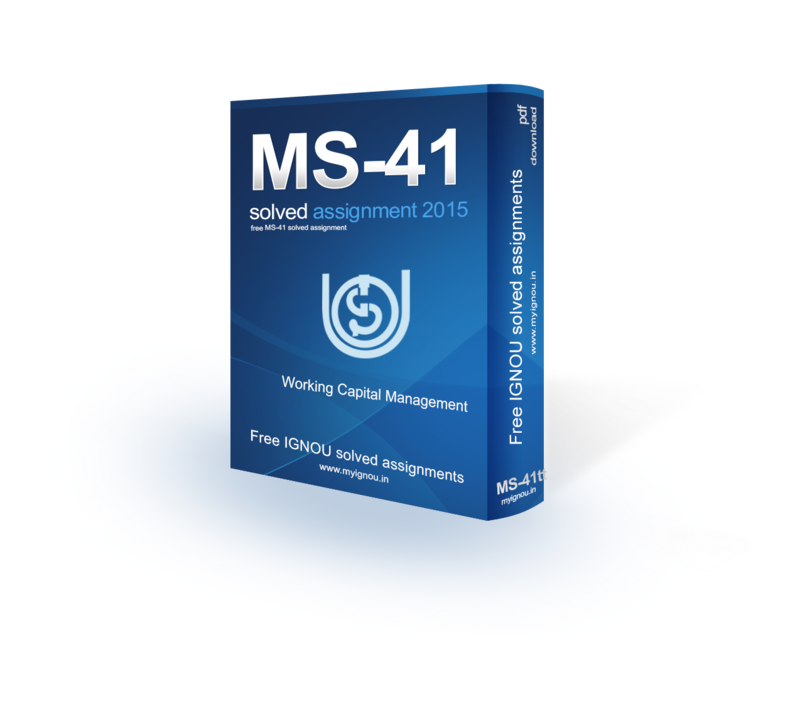 Here you will be able to download IGNOU MS-41 (Working Capital Management) Solved Assignment for (January - June) 2015 session for free exclusively on this website. To get other solved assignments like our facebook page. Q1. Distinguish the different working capital financing strategies. Under the present capital and money market conditions which of these would you recommend to a consumer durable manufacturing firm. Explain with reasons & list out your assumption, if any. Ans: There are broadly 3 working capital management strategies / approaches to choose the mix of long and short term funds for financing the net working capital of a firm viz. Conservative, Aggressive, Hedging (Or Maturity Matching) approach. These strategies are different because of their different trade-off between risk and profitability. Another remarkable difference is the extent or proportion of application of long and short term fund to finance the working capital. The terms methods of working capital management, strategies and approaches to working capital management are interchangeably used in general parlance. But, ultimately the concept is important. We need to understand the following relationship in depth for understanding the concept in its true sense. Profitability Standpoint: In general, short term interest rates are cheaper to long term interest rates because of the term premium. That means short term has lower interest cost and higher profitability whereas long term has higher interest cost and lower profitability. Especially, when the long term funds are utilized to finance the working capital, unnecessary interest is paid for the periods when the funds are not utilized. In essence, the short term financing wins the race if profitability is the concern. Let’s now look at the risk concern. Share "Download MS-41 Solved Assignment 2015"
Share this page (Download MS-41 Solved Assignment 2015) to let others know about it!